Buff Epic Run Barcelona. 8k fancy dress fun run & obstacle Race at Montjuic Castle. This is Barcelona's whackiest run - possibliy the world's craziest Christmas run too! The Barcelona Buff ® Epic Run at Castle Montjuic is a fusion of Monty Python and athletics. 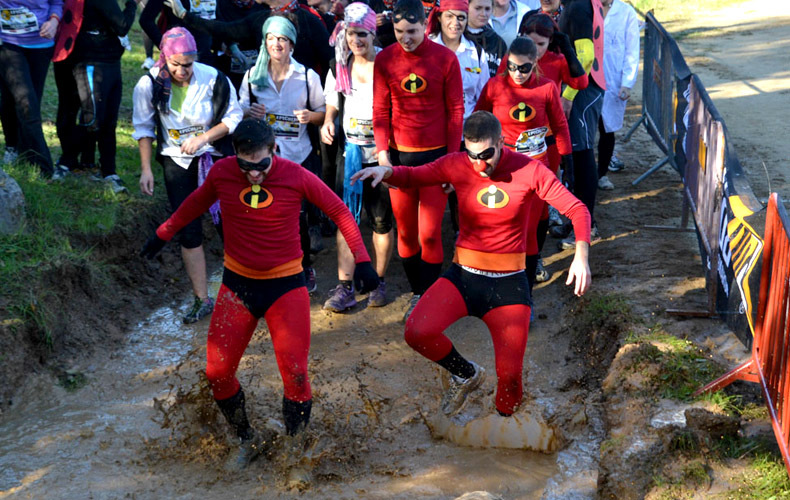 This annual fancy dress fun run takes place every Christmas in Barcelona, The Buff Epic Run is a 8k fancy dress crazy obstacle race round Montjuic castle on Montjuic hill. Among the 17 obstacles are a mud-pit, foam bath, tyres and many other obstacles. There is also a Mini Buff Epic Run for juniors 13 to 16 years old. The costumes worn by many runners have a medieval theme in keeping with the castle venue, but other fun costumes can be seen and there are prizes for the best buff epic costumes. All runners get a Buff customised for the event. There is no timing, so everyone can run at their own pace and after the race there is a botifarrada sausage fest for runners. Registration costs €20 and is open until mid-December. The Buff Epic Run is very popular and places are limited to 2,500 participants, so register early. A crazy and fun Christmas run for all. Montjuic Castle 'Castell de Montjuïc' in Barcelona is located on the highest point of the Montjuic hill which is the hill that can be seen from from the city center on the south coast of Barcelona on the way to Barcelona airport. Montjuic castle overlooks the sea and Barcelona city from an altitude of 170 meters / 550 feet and has superb views of Barcelona city and the port area. The castle is a former military fort that was handed back to the city in 2008 by the army. Montjuic castle is now for a variety of cultural events among others the Merce Festival. Montjuic castle is open to the public and admission price is around €5, which includes access to castle cistern and some cells. Take Metro to station Parallel on Green line L3. Take Montjuic funicular train then take Montjuic cable car. Or walk from top of funicular train to Montjuic castle which takes about 10-15 minutes.